Eleven years ago this July, I had the opportunity to attend an esoteric (occult) event in the city of Fort Wayne, Indiana. It was an interesting day: lots of occult teaching, a group channeling and vision session, and what could be described as an encounter in mass hypnosis. My job as a researcher was simply to watch and learn, and to get a handle on what key trends the New Age movement was gearing towards. Of all the different activities of the day, however, one stood above the rest. Told to stand, attendees held each other's hands and formed a large circle. The moderator explained that energies would empower this loop, and a musical entertainer stepped into the center and started singing. When the last line of the song faded out the moderator reverently said, "The Christ within me salutes, honors, and respects the Christ within each and every one of you." All around me people started bowing to each other and acknowledging the "Christ within..."
I watched dumbstruck. Then it hit me; I had just witnessed a repeat of the big lie. According to Genesis 3, Mankind's Fall revolved around the eating of forbidden fruit. Satan after approaching Eve, subtly questions God's authority and places a positive spin on what would be an act of overt disloyalty to the Creator. Satan's tactic wasn't about denying God; rather it was a strategy of deception, doubt, and disobedience. Now the serpent [identified as Satan] was more cunning than any beast of the field which the LORD God had made. And he said to the woman, "Has God indeed said, 'You shall not eat of every tree of the garden?'" And the woman said to the serpent, "We may eat of the tree which is in the midst of the garden; but of the fruit of the tree which is in the midst of the garden, God has said, "You shall not eat it, nor shall you touch it, lest you die.'" Then the serpent said to the woman, "You will not surely die. For God knows in the day you eat of it your eyes will be opened, and you will be like God knowing good and evil." So when the woman saw that the tree was good for food, that is was pleasant to the eyes, and a tree desirable to make one wise, she took of its fruit and ate. She also gave to her husband with her, and he ate. Satan's insinuating message focused on doubt, and the illusionary promise of self-deification through new knowledge- "you will be like God, knowing good and evil." The focal point seems intellectual, as Eve is desirous of knowledge; however, the act demonstrated rebellion. It was a direct challenge to the Creator's authority by the creation. God is restrictive and holding back on you, so hinted the message, and now it's time to chart your own course. You too can be "as God." Hence, the human race believed the spin and took the plunge, only to discover that pain, sorrow and death resulted - and a separation from the Creator. The "knowledge" gained could never offset the relationship that was now lost, or the distress of living to die. Yet from that time onward we've repackaged the Big Lie in a myriad of ways. After all, "we know best." Thus the proclamation of self-mastery, Man as God, is a repeated theme. Remember Out on a Limb - Shirley MacLaine's 1987 TV miniseries? At one point Shirley and a friend stand on a beach with arms outstretched and boldly announce, "I am God." Theosophy, a religious development from the 1880s that birthed the modern New Age Movement proclaims this self-mastery concept. The esoteric philosophy of Freemasonry is strikingly similar. Man is not compelled; he is to be free. He is not a slave, but a God in the making. - Annie Besant, Esoteric Christianity, p.220. To be perfect as the Father we must be equal with him, and hence here we have the ancient doctrine taught of old by the Brahmans that each man is God and a part of God. This supports the unity of humanity as a spiritual whole.... William Q. Judge, "Points of Agreement in All Religions." Address to the Parliament of Religions, April17, 1894. Here lies the great secret of Masonry - that it makes a man aware of that divinity within him. - Joseph Fort Newton, The Builders, p. 293. Man is a god in the making, and as in the mystic myths of Egypt, on the potter's wheel he is being molded. When his light shines out to lift and preserve all things, he receives the triple crown of godhood... Manly P. Hall, The Lost Keys of Freemasonry, p. 92. All of this resonates with the New Age Movement. John Randolph Price, a New Age advocate and author, boasts of self-mastery and personal divinity. This is why Oprah matters: What she peddles sells, what she promotes is believed. And she promotes A Course in Miracles on Oprah Radio and through her website. If you haven't checked it out, A Course in Miracles is a New Age program mean't to assist you in discovering your higher self. Here are a few of the "truths" you learn in the lessons. Lesson 29: "God is in everything I see." Lesson 61: "I am the light of the world." Lesson 70: "My salvation comes from me." Oprah also endorses Eckhart Tolle, an author who teaches higher-consciousness evolution (New Age beliefs). You can substitute "Christ" for presence, if that is more meaningful to you. Christ is your God-essence or the Self, as it is sometimes called in the East. The only difference between Christ and presence is that Christ refers to your indwelling divinity. -Eckhart Tolle, The Power of Now, p. 104. Really? I have to look within to find my "indwelling divinity?" And "my salvation comes from me"? If I am honest with myself, I'm compelled to recognize that there's nothing within my nature that's pure or divine. Instead, my heart is dark. My inner nature is the same as all of humanity: plagued by sin, deceit, and pride. Not only is this evident in my fallen ways, it's a fact borne out in the Bible. I can't "save myself" - it's a logical and spiritual impossibility. I need someone who isn't tainted to be "my salvation," hence the saving gift of Jesus Christ, the perfect lamb of God (John 1:29) Yet to accept this gift requires the recognition of my sin-state and the acknowledgement of Jesus Christ as the Son of God. This doesn't come natural or easy for fallen Man, especially as we're prone to mimic lyrics of Sinatra: "I did it my way." After all, to admit I am a lawbreaker in God's eyes, without excuse and without the ability to remedy this position on my terms is humbling. So much for "being God." What the writer failed to comprehend is that Jesus Christ is the one who made the statement: "I am the way, the truth, and the life. No one comes to the Father except through me. "(John 14:6) When a Christian asserts that the exclusivity of salvation in Jesus Christ, it's a reflection of a Scriptural standard. How the Christian expresses this truth may be another matter (example, arrogance verses love). Today, many individuals flirt with the interfaith approach. For example COEXIST bumper stickers are now a popular way to express spiritual unity, with each letter represented by a different religious or philosophical symbol. But this isn't really about "coexisting" - we already do this as a pluralist, democratic society. Rather, it's about proclaiming "truth equality" among the religions: the cultural mainstreaming of the interfaith agenda. And here we come face-to-face once again with Genesis 3. For to say that all religions are valid faith expressions is to assert that God's position on this issue, which can be found throughout the Old and New Testaments, is grievously mistaken. In other words, our interfaith opinion supersedes God's exclusive claim: "...there is no God apart from me, a righteous God and a Saviour; there is none but me. Turn to me and be saved, all you ends of the earth; for I am God, and there is no other. "(Isaiah 45:21). The interfaith position demands that our collective religious viewpoints are right, and that God's exclusivity is wrong. It hearkens back to the Big Lie, for to state that all religions are valid paths to God, when God says otherwise, is to elevate our opinion above the words of the Creator. Opinion trumps God. Another form of "Man as God" can be found in the political arena. For much of the twentieth century the idea of a world government has been upheld as the globe's political savior. To this end, the United Nations has been viewed by many as the most relevent, international master. 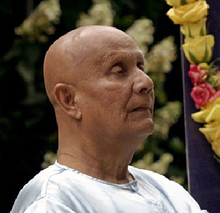 Sri Chinmoy, (see above) leader of the UN Meditation Group for 37 years, was keen for this global political/spiritual edifice. Robert Muller too envisioned a spriritual/political entity along global lines: "...someday our planet will be a world spriritual democracy. "(7) [in the words of the popular Beetles song sung by John Lennon, come and join us when the world will be as one...ed.] Consider what this former UN Under-Secretary-General said in his book, New Genesis: Shaping a Global Spiritualiy. There's even a specific religion that looks to the coming of a world government as the savior of humanity, the Baha'i faith. (9) You see, for those who are true internationalists, government at the global level will be viewed as a God-type - the ultimate management system, where an enlightened Group directs the action of a world citizenship. But what happens if this world government becomes tyrannical? How can the world be assured that this political structure would act as a benevolent savior? An elevated personality is what we need: a special individual - a transcendent figure - to chart a course for world peace. Are the peoples of the world that gullible? Yes. Notice the personality cults of the past and present, where mass groups within nations and around the globe have viewed one politically empowered individual as savior-like. (Note: this name list does not imply that these individuals are necessarily alike, just that they commanded a special public attraction that went beyond the normal). -Joseph Stalin: Leader of the USSR from 1924 to 1953. Stalin is often (and correctly) used as an example of a personality cult, masterfully using propaganda, political maneuvering, and spin to create the image of a public hero. -Adolf Hitler: The charismatic leader of National Socialist Germany, Hitler's magnetism and dynamism swept the nation. He embodied the concept of a Germanic messiah. -Mao Tse-Tung: Leader of Chinese communism and considered the "great helmsman" who would lead China forward. Although Mao is long gone, his picture and political personality is still dominant in China. -President Barak Obama: No other US President has been the focus of so much frenzy. Mr. Obama, especially during the early days of his campaign, had a personality cult following. Consider the following statements. ..we're here to evolve to a higher plane...The reason I love Barak Obama is because he is an evolved leader who can bring evolved leadership to our country - Oprah Winfrey, 12/09/2007. Obama to me, must be not just an ordinary human being but indeed an Advanced Soul, come to lead America out of this mess...-Chicago Sun-Times commentator, March 21, 2008. I see Barak Obama as a leader for this transcendent moment, the agent of transformation in an age of revolution, as a figure uniquely qualified to open the door to the 21st century and to convert threat to great new opportunity - Gary Hart, "Politics as Transcendence'" Huffington Post, Feb. 13, 2008. A very interesting collection of Obama personality-cult stories can be found at obamamessiah.blogspot.com. What does this cult of personality show? That humanity greatly desires not the true God, but a political messiah who will lead the world to peace and prosperity. [The Jews in Jesus day rejected him for the same reason. They were looking for a political messiah to restore Israel and the Jews to political greatness once again. Interesting how history repeats itself and the Big Lie never goes away, but only comes back in a new disguised form...ed.] Is this illusionary? Yes, but the world is willing to trade truth for the fiction of personal and global security. Taking this one step further is a little document titled Transformation of the World. Passed around by a non-governmental organization during the UN Millennium Forum, this short booklet explains that what is needed is a humanist for of world government, complete with a "World King"
Give us a god, any god - be it based on our opinions, politics, or personalities. We want to bend our knees to the images of our own pride, but not the true God. Does all of this remind you of a well-known Frank Sinatra tune? "My Way" proclaims self-mastery and intones that God isn't necessary. Why should He be if you are the master of your own world? You are in complete control of your destiny, are you not? You hold the power of life and death in your own hands, right? Maybe you've simply forgotten the New Age teaching of personal deification. But then again, what kind of a god are you that you have to be told that you're god? We are fools - every one of us - to think that "self" can be its own savior, that human opinion supersedes the laws of the creator, that a global political machine will rescue us from ourselves, and that a human World King will lead his "loyal subjects" with benevolence. Man as God? All we do is keep repackaging the Big Lie. Again and again and again. "How long will you love delusions and seek false gods?" - Psalm 4:2. "They profess that they know God; but in works they deny him, being abominable, and disobedient, and unto every good work reprobate." Titus 1:16. Carl Teichrib is editor of Forcing Change, a monthly publication documenting the rising challenges of globalization. A printed copy of this article can also be read in Hope For The World Update, summer 2010 edition. To subscribe click the Hope For The World Update link above. 1. 1999 Year of the Convenant conference program. July 10, 1999, Spiritual Unity of Nations. 2. This author audio-taped this event and has the micro-cassettes in archive. Stair's statement is on Tape 1. 3. John Randolph Price, The Planetary Commission (Quartus Foundation, 1984). p. 133. 5. Christian Smith and Melinda Lundquist Denton, Soul Searching: The Religious and Spiritual Lives of American Teenagers (Oxford University Press, 2005), p. 74. 6. Sri Chinmoy, Dag Hammarskjold Lecture, January 1973. 7. Robert Muller, New Genesis: Shaping a Global Spirituality (World Happiness and Cooperation, 1982, p. 10. 9. See Forcing Change, volume 1, Issue 3. 10. As quoted in Richard Nixon's book, 199: Victory Without War (Simon and Schuster, 1988), pp. 29-30. 11. "Pope John Paul II buried in Vatican crypt," CNN, April 9, 2005. 12. Yermentay Sultanmurat, Transformation of the World (2000), p. 25. 13. Maurice Strong, Where on Earth are we Going? (Knopf, 2000), p. 29.